Stumped by why do computers freeze and how to get running and back to work? If you're asking the question "Why do computers freeze", it's a safe bet you're a Windows user, since Apple computers rarely freeze, as any Apple owner will be happy to tell you over and over. Computers using the Windows operating system from Microsoft have been known to freeze or lock up or "go blue screen" since the day it was released. While the frequency has gone down with Windows 7, computers can still freeze. Here's some reasons why. One major cause of software freezing is hardware, especially in older computers. The device that has the most mechanical parts, gets the most use and is most prone to problems is the disk drive. A bad sector can lock up a system when accessed. Running system and disk diagnostics can make reassignments to avoid bad sectors, but if you find them locking up the system frequently, back everything up and replace the disk. RAM memory boards, motherboards and other internal components can also go bad and lock up a system, especially if your area is prone to power spikes or electrical storms. Power strips and battery backups can cut down the frequency of these freezing your computer. Replacing components due to repairs or upgrades can also cause freezes. Make sure all components are in the right slots, all are properly secured and there are no device conflicts - running Device Manager will identify them. Keep the area around your computer clean and dust-free - dust and dirt can cause components to deteriorate. 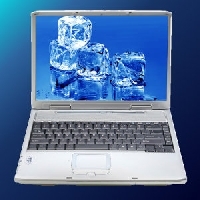 To avoid freezes due to overheating, have plenty of area around your computer for ventilation - put your notebook computer on a stand or use a USB-powered cooling pad. Another reason why computers freeze is viruses, spyware, worms, malware and other pieces of software installed on your computer without your knowledge by hackers, unscrupulous websites, businesses and other nefarious entities looking to capture data about you for all sorts of purposes. If your systems is running slow or freezing, run some reputable anti-virus and anti-spyware programs - there are many good ones that are free of charge. Make sure you're using the very latest versions to identify and remove the very latest viruses. Windows itself is a leading cause of computer freezes, especially in early versions of a new release. Use the automatic update feature to insure you're getting the latest patches and fixes from Microsoft. Familiarize yourself with the system tools so you can clean out the registry or defragment the disk drive - two areas where small problems can build up into freezes. Older versions of Windows can lock down areas of memory, fail to reset pointers and do other internal things that will eventually slow down or freeze up a computer. Web browsers with their cookies and add-ons will also cause freezes. Restarting the computer on a regular schedule can clear a lot of these problems, along with adding more memory. The programs you run on your computer can also lock it up, usually because the use too much memory or conflict with another program. Restart the computer, then run one program at a time to pinpoint which one is causing the freezes. Those are some of the most common reasons why computers freeze. If you're having frequent problems and aren't computer savvy, do yourself a favor and take your PC to a reliable technician.